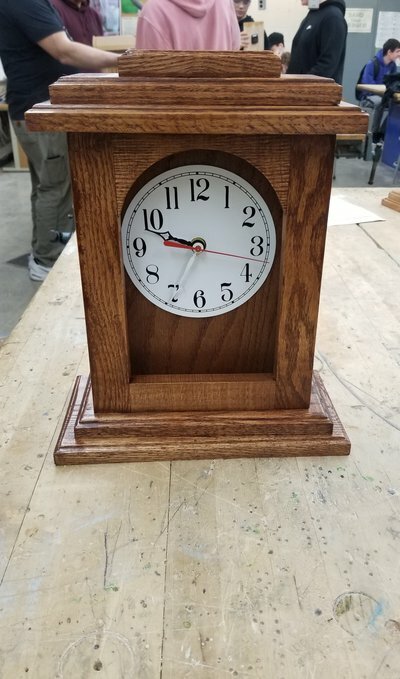 You guys like the clock I made in woodshop? id like it more if there was just a cricle and the clock was in that circle instead of half a circle and then a rectangle on bottom. Looks good, looks like oak. It's rad your school provides that! Only thing, I'd like to see a classier clock face in it! It'd look good with glass too, but I doubt you'd be able to rabbet that arch at this point to fit glass in. Super old school and nice woodwork! Why is there a significant gap on the right of the clock face and none on the left? None of the grains of wood match in the framing. It looks nice upon first glance. iFlip Why is there a significant gap on the right of the clock face and none on the left? None of the grains of wood match in the framing. It looks nice upon first glance. Looks good but next time use darker wood with fake gold accents to make it look nice and definitely a border around the clock itself. Honestly, it looks like a bomb.